There are big birds that only extreme pet collectors try to take on, and then there are the smaller ones who have just as big a heart and really do make up for their physically small stature. The Hahn’s Macaw, a miniature version of the colorful parrot, is very much this category. The creature is lovable, social, noisy if trained to be so, active, perks up to interact, and best of all can be managed very easy due its small stature (which is a good thing for pet owners who don’t have a whole lot of space to work with). The Hahn’s Macaw is technically a mini-macaw. It looks very much like its other macaw cousins, albeit without the big feathers on the tail or crest crown on other birds. 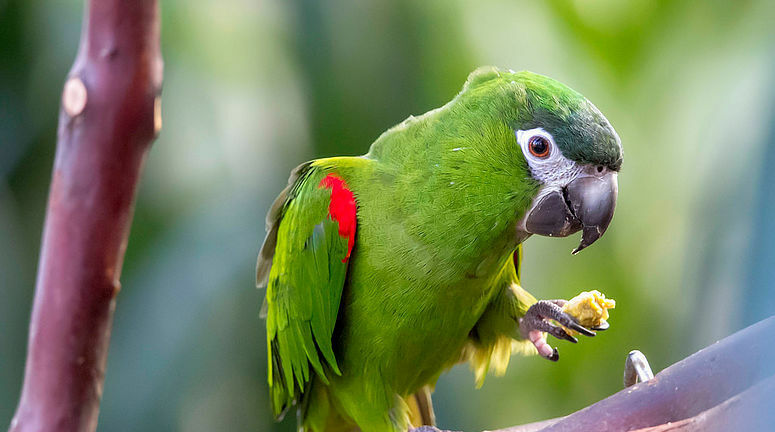 However, the Hahn’s Macaw does come in a typical deep lime green color, and these critters more than make up for their size with how attached they get to their owners for interaction. Naturally, the Hahn’s Macaw is found in South America, in large populations on both the Atlantic and Pacific sides. Geographically, the birds will be most often located in the flatlands in either jungle or savannah. As a pet, the Hahn’s Macaw does need a varied diet to live well. This is a key factor in literally how long the bird will live. Typically, hahns macaw lifespan average is 30 years but some vibrant examples have gone a half century. Taken care of well, owners do need to consider the longevity of these birds and how to take care of them if the owner him or herself should need to transfer the bird late in life to someone else. This is probably not the bird pet to think about getting if one is already in retirement, for example. An additional factor affecting the constitution of the bird is how much space and exercise the Hahn’s Macaw receives or can access. Sitting around and these animals act very much like humans in the sense that they get fat and unhealthy from overeating and no calorie burning. They are also big on entertainment, which means a typical owner will need to plan for lots of time spent with the bird, even if just playing with it lightly. Hahn’s Macaws want attention, period. Many a bird has grown depressed and unhealthy, even engaging in self-mutilation out of boredom and lack of interaction. Like most parrots, the Hahn’s Macaw will learn to vocalize and respond in kind if taught to do so. They are very intelligent and inquisitive, two traits that help them figure things out, including how to get out of their containers if left unlocked. That said, they want to belong, so once bonded to a pet owner they are more than likely to figure out a way to get close and be held. They, however, do love to chew on things and climb, so fabric materials are going to get torn up with regular tracking. If the bird is going to be a pet for a child, the Hahn’s Macaw will be a far better choice than a full-size bird. One, they can be handled far easier. Two, they are not aggressive per se and like to be handled. They also don’t nip very much as long as they are cared for gently. Obviously, young children having such a bird is out of the question, but pre-teens and young teens will definitely love these mini-macaws for pets (except maybe at night if the bird refuses to be quiet but that depends on how it has been trained). Size-wise, a normal Hahn’s Macaw will grow something between 12 to 14 inches in full length. Again, this is a good size for a compact space, such as an urban living in a condo or apartment, but these birds can be noisy. Depending how they are exposed to stimuli, these mini-macaws can whistle, squawk, squeak, and croon for attention. In terms of physical health, the Hahn’s Macaw can be afflicted by all the same issues as any other macaw bird, and they have a typical issue with an ongoing beak growth. So, they need the proper tools to keep the beak sized and wearing down regularly (i.e. grinding). Again, diet is a big part of their overall health and vibrancy. A proper mix of lots of different nuts, fruit, plant base food and chewing is must. High protein nuts are a big plus and pre-designed nut bars often given a good mix of a macaw's diet in captivity. But don't be surprise if the little fellow start's trying pilfer snacks when let loose to wander. Hans Macaws price falls between $650 to $1400 from a licensed breeder or commercial store depending on size and ages. Because they tend to be so popular and easy to manage, Hahn’s Macaws are fairly easy to find. They won’t be the lowest cost bird due to being a parrot, but they are stocked in good numbers nationwide at bird-specialty vendors. Ideally, you want to secure your new pet from a licensed breeder or commercial store. These birds have been known to be smuggled in some markets, and consumers who try these avenues to save a few dollars are often saddled with a traumatized bird suffering multiple health issues for years. It’s simply not worth the trouble. If you’re looking for a parrot or similar bird pet, but you don’t want a big production and large cage, then the Hahn’s Macaw is probably one of the best bets for a starting bird pet. But again, remember, their long life span means you’re making a long-term commitment for care for this kind of bird. So be willing to commit to a life partner.